Hi All Young Peoples ! A shot of Vodka loud music and crazy flickering lights that is what young India wants today. Night life may sound like a music to your ears but this word has been a big taboo for our elders and especially for the famine gender. To be honest it is something that we have inherited from the Western world and why should not we? We are moving up rapidly toward westernization and I take that for a good cause because everything has its merits and demerits and thus merits of westernization are far more than its demerits. Night life is something very new to India and we have started it very recently. The generation X needed something which can chill them out of the pressure that they go throughout the day. The schedules are so hectic and the work load is so fuzzy that they do not find time for themselves and thus the Night Life comes into action. The Night life gives them the freedom that they want and that they deserve. One who can’t have the day can have a good night after all. India is developing rapidly on the concept of Night life and we can find out many such places where we can have a late night party, dance, music and fun. Although it is not easy to spot all the happening places in the city and thus we need a little assistance for that and thus for this assistance here I am to introduce to the latest sensation in this field the Live in Style. Com. This online portal is capable of fixing your night with any fun and entertainment you are looking for. The web site is currently running successfully in few cities namely Mumbai, Delhi, Bengaluru, Kolkata, Hyderabad and Pune. The web site gives out information about all the events that are going on or going to be held in a particular city with each and every need to know information like venue, timing, details of the event and etc. Isn’t that wonderful? the website is one of the best Night Life and Pub Finder website in India. 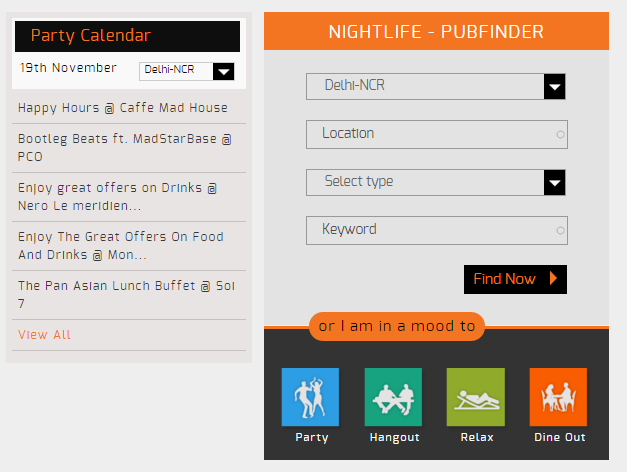 Check out the website yourself Nightlife in India. The website has been designed so perfectly avoiding all the nascence. They have a party calendar installed which gives you all the dates of the party scheduled. So basically you have a gin who can tell you everything about parting. There are few more fabulous features that you can find on the web site like the Drink calculator which helps you to estimate the quantity of drink you need to order for a party, Invite in style other cool feature which helps you make customized party invitations. The web site can help you with planning a party too. “With a great party comes greater responsibilities”, wonderful yet so meaningful line. We need to Live Responsible after we party. It is not a crime to part hard but to break rules and to do unexpected things are something very common and should not be done. We should be drinking in our limits and if we drink out of our limit we should always try and leave the party then and there so that it doesn’t embarrass us or our friends. We should always know the do’s and don’ts of after party. We should never drink and drive or even let our drunk friends drive. The website has a few very interesting tips like how to get rid of your party hangover, Rules to avoid embarrassing night, how to be a responsible host and etc. I will say Live Responsibly. If you wish to party hard and have no idea what to do and where to go do visit the liveinstyle.com.